again ES key levels 2866 2876 2884 2892 see how it goes after open... first 30 mins will set up the tone for rest of day.Markets are flat,gold is down 8$,oil is flat. $SPX $NDX #ES_F $TSLA $BTC. The ES has bounced up from support at 2868 (21 points below yesterday's high). Next step up should carry to 2910.Gonna close 181$QQQ A 5 CALLS today or tomorrow.Trump will meet chinese ofiicialls today about tariffs and GONNA TWEET TODAY AROUND 5 PM. /ES If 2868 support fails downside target will be 2846 Carl Futia. 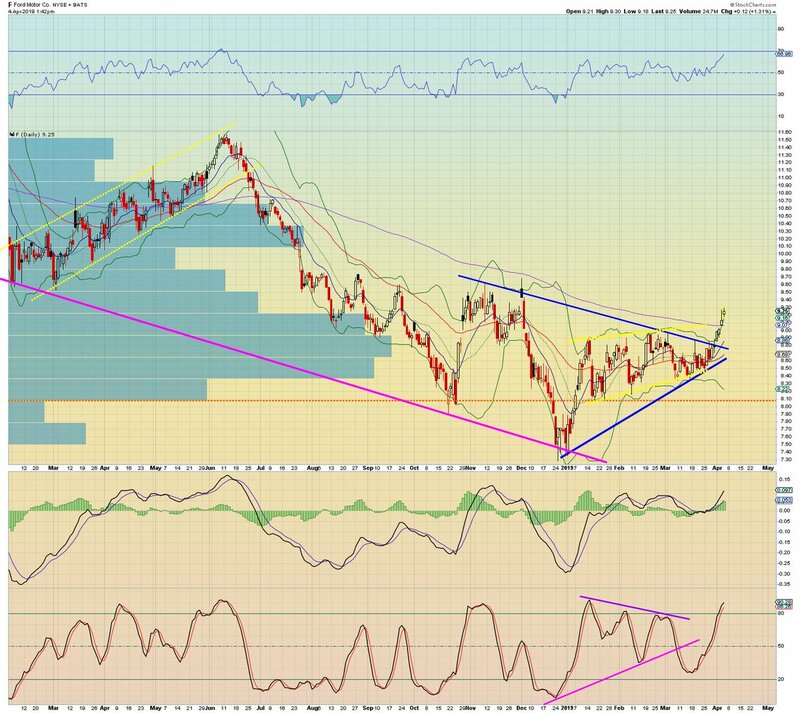 $USD Daily: #USD 13MA & BC tested today as support and held so far, but Isuspect they will be breached soon. 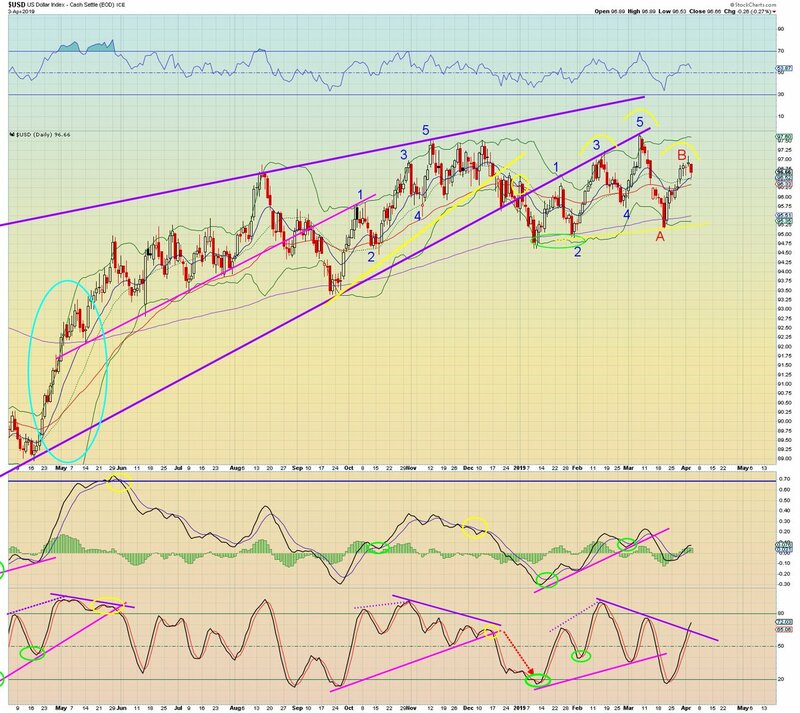 96.33 is the only level that matters right now on DXY (50MA)... #DXY $DXY #FX #forex P.S. THE chart is 11 hours old,BULL TREND is STILL IN. 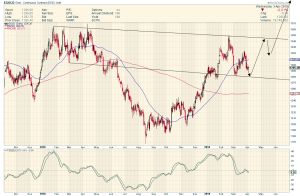 $DXY 97.30 FOR NOW. Still range move.... big $$ showing no intent pulling up mkt.. Looking at this there are a whole host of things that jump out at me from a scientific/pattern point of view. Firstly the cycles themselves. The two complete cycles since this paradigm (post gold standard) began have displayed perfect wavelength repetition. The period of time from low to low was duplicated beautifully. Secondly, the amplitude (peak to trough, shown by the vertical red arrows) is steadily declining – we are in a 50 year bear market. 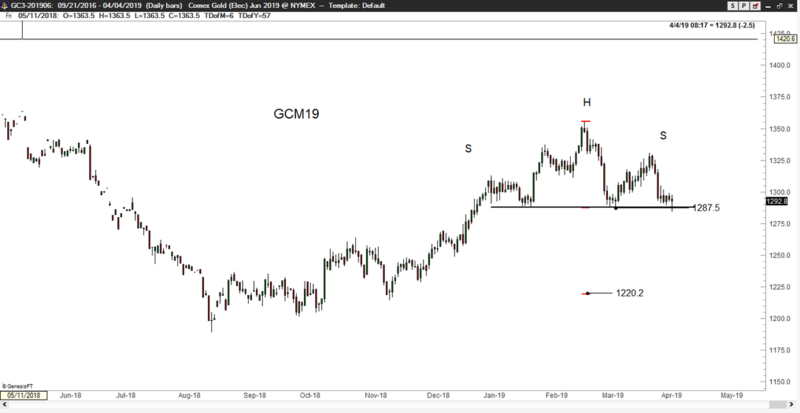 Next, the target area for a final low and new cycle beginning (red rectangles) are equal in size, shape and positioning. Turning to the TRIX (which I find very useful, as it combines trend and momentum), we can make some very useful factual statements. Number 1 – During each of the 3 cycles, the early ‘bull’ phase was characterised by TRIX moving from -40 or less through zero (shown by red up arrows and orange circles). Number 2 – ‘bear’ market confirmation in each cycle comes when TRIX falls from above 40 and passes through zero. So what is going on right now ? We appear to have fallen from above 40 and bounced at the zero line. The black arrows show where TRIX has ‘wobbled’ close to the zero line. The important point for me here, is that it doesn’t mean a change of trend. 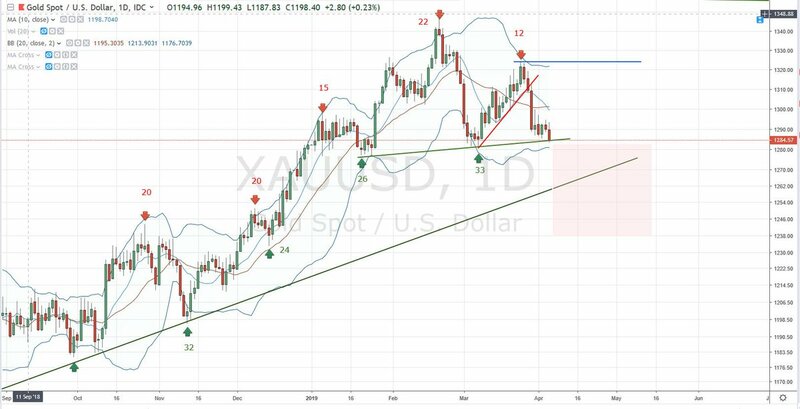 In the past when this happened, the TRIX resumed its previous path, which in this case will be down, thus giving final confirmation of the bear trend, targeting the third red box which covers the period 2023 to 2026. Great Scott ! 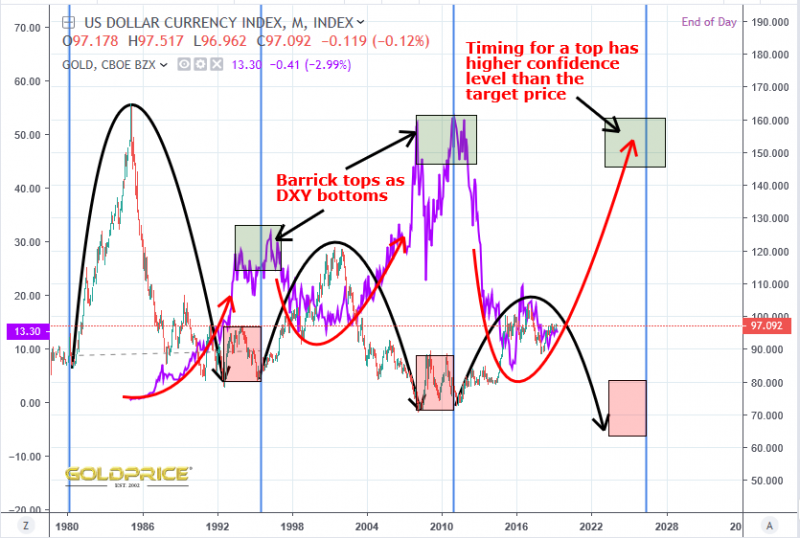 – the Dollar is displaying a decreasing amplitude (energy) and Barrick is doing the exact opposite – the distance between each low and following high is increasing. For anyone with a science background, that’s entirely unsurprising. It’s exactly what you would expect if there is an exponential component to Dollar ‘devaluation’. I used Barrick because it goes back further than HUI etc, but a mining index would be the same. The million (or multi-trillion) Dollar question here is why ? What is it that’s causing the Dollar to follow an ever downward path ? The index is showing the Dollars relative worth compared to a basket of currencies from its main trading partners. It peaked just above 160 in its first cycle, just above 120 in its second cycle, and just above 100 this time. I know some here believe the cycle will fail here and we won’t head into that low between 2023 and 2026 – instead breaking upwards and making new highs. I beg to differ. 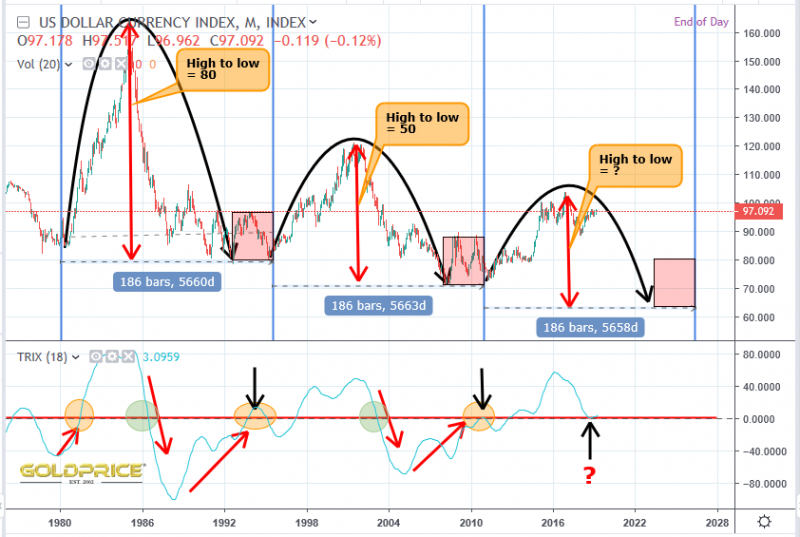 It goes back to that fundamental question – why is the Dollar losing its grip, and is there something that will reverse a 50+ year trend of Dollar decay ? I believe the wheels that were set in motion in the early 1970’s will continue and ultimately lead to the Dollars demise as world reserve currency. Probably not for many, many years yet, but once a trend like this is in motion, the momentum is huge and usually irreversible. It keeps going until a ‘tipping point’ is reached – that when a new paradigm begins. It’s not a particularly ‘scientific’ concept – it’s just another way of saying ‘birth, growth, vitality, maturity, decay, demise, death, rebirth.North Star. 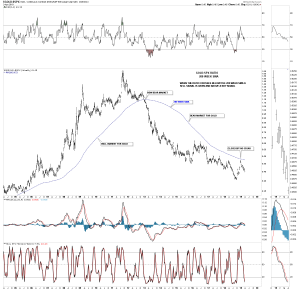 Below is another ratio chart we’ve been following which compares gold to the SPX which is moving in the wrong direction. Earlier this year the ratio came right up to the 200 week ma but failed to breakout which would have confirmed a new bull market. This last chart for tonight is one I haven’t shown you before. The green shaded area represents the first trade I made shortly after the necklines were broken to the upside. The right side of the green shaded area is where I exited those nine trades that were all winners but were just singles. With the 3 X leveraged trades I expect much better results. This is also a good example of what I discussed in the last Wednesday Report when I wrote about, ” you never go broke taking a profit.” This is what can happen when you get out too early. We did get a small decline after we got out but, I was able to get back in for the most part but it took nerves of steel to go back in. 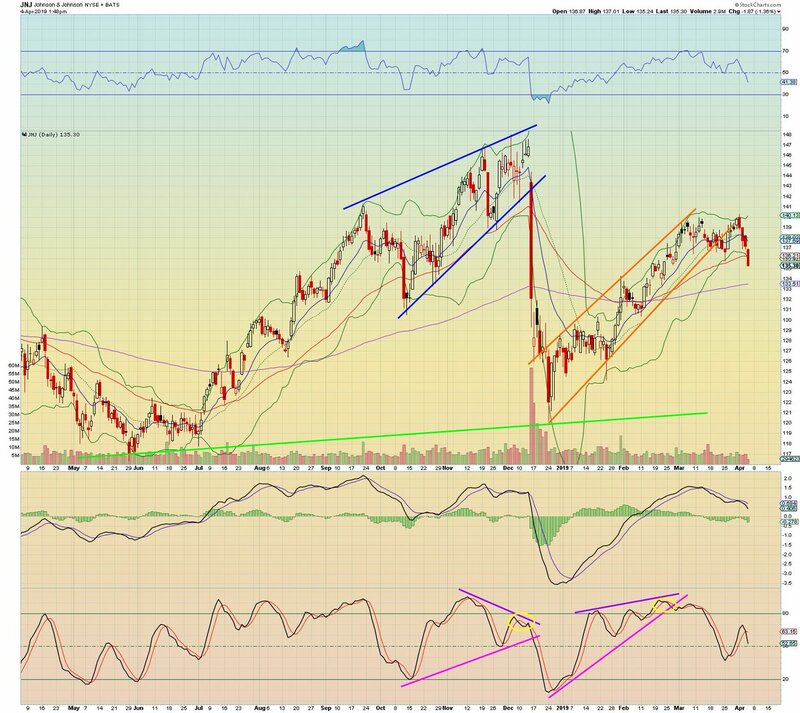 What is happening now is that most of the US stocks markets are completing their February trading range with many breaking out and several testing the top rail of their small consolidation pattern. Last edited by froll61; 04-04-2019, 12:51 PM. It really want's to do it now! p.s. The chart is 6 hours old. No go, looks like the metal group is anticipating bad numbers tomorrow. Bob completely missed last IC, he was shorting all to way up then went long at the top. Miners are rocking today.Platinum is breaking out,Palladium is dumped today. $IWM 155.69 long new Alright we have excellent market breadth now. Even if the Dow drops to fill this recent gap we should continue to push higher over next few weeks and months into new highs across the market. I expect a lot more out of steel , copper, aluminum, gold. Basically all metals and miners.